Easy Instant Pot artichokes with creamy dill dipping sauce ready in less than 15 minutes! 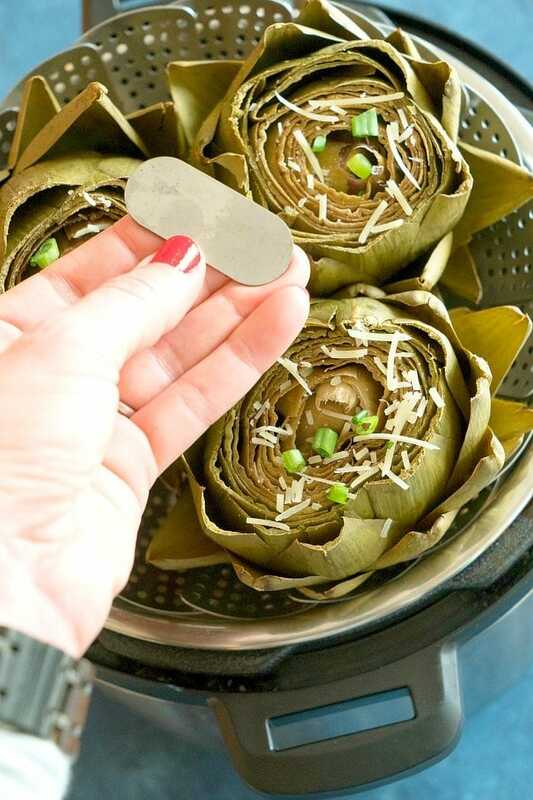 How to steam artichokes in your pressure cooker to perfection. Our favorite vegetable for dinner and a healthy side dish too. You’ll never make an artichoke another way again after this. Of course I think artichokes are great as is but with a creamy dip on the side it goes from good to totally amazing. I prefer a creamy sauce versus just melted butter for dipping. That is entirely up to you. If you’re like me you’ve gotta try this creamy dill dip recipe I have listed below. There aren’t a lot of accessories I have and recommend but this Instant Pot steamer basket like this one from Kitchen Deluxe with an extendable handle is one of them. 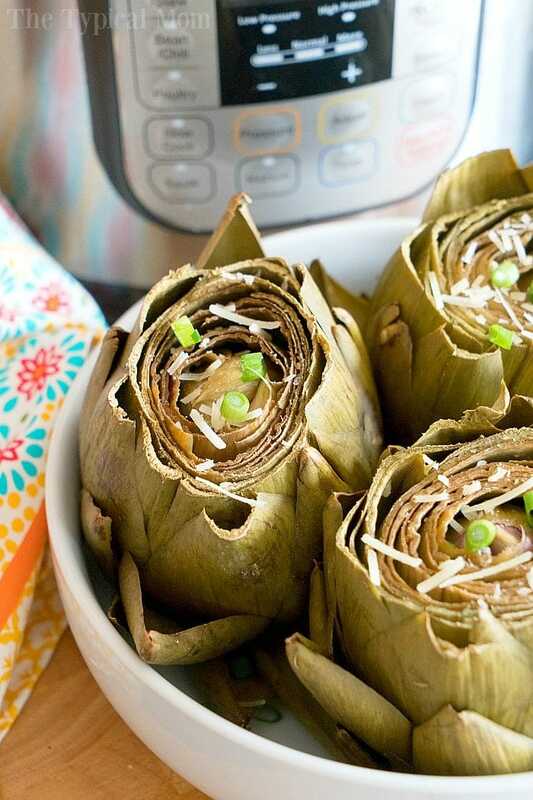 This basket is a necessity when making these Instant Pot artichokes. I have tried other Instant Pot vegetable steamer baskets but I like this one because of the long handle to pull it out and they have another middle hook option that’s helpful so you don’t burn your fingers lifting it out. Using these Instant Pot mini mitts are really helpful too lifting anything out of your pressure cooker, they’re the perfect size. I do my best to eat healthy. The nice thing about cooking in an Instant Pot is that something like an artichoke that takes a good 25 minutes from start to finish on the stove top takes just 8 minutes (and maybe 7-8 to come to pressure)…so less than 15 minutes for all 3 to be perfect! Of course everyone has a preference as to how soft they like their artichokes but 8 minutes for a few medium (on the larger side) works well to get them just soft enough to scrape the “meat” off the leaves and the artichoke heart to not be mushy (the way we like it). Of course if you can only find large ones I would opt for 9 minutes, where very small ones would be better at 7 minutes but this is a good gage. 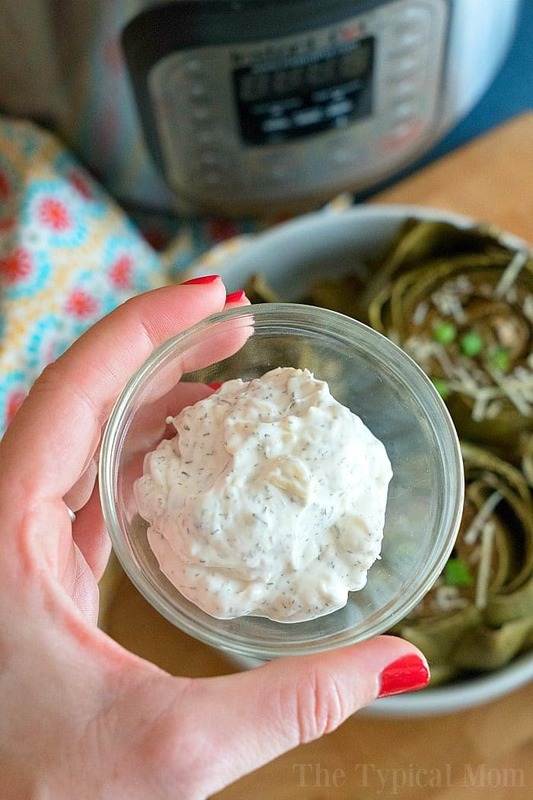 Of course you can eat them plain but we love this dill dipping sauce for our artichokes. Personally I think this vegetable is pretty good just sprinkled with some salt but really having a yummy dip makes them really over the top. Most of the ingredients I used for this creamy dill dip I am sure you have in your cupboard. I just stir it together and serve it on the side. When the artichokes are done I serve them topped with a little more sea salt and sprinkle some parmesan on top of that. If you want softer artichokes set on high pressure again for 2 minutes, then check again, etc…. Looking for more Instant Pot vegetable recipes? Easy Instant Pot artichokes with creamy dill dipping sauce ready in less than 15 minutes! 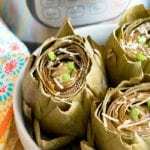 How to steam artichokes in your pressure cooker to perfection. Our favorite vegetable for dinner and a healthy side dish too. You'll never make an artichoke another way again after this. Cut tops off your artichokes so pointy ends are cut off and top of artichoke is flat (as seen in top picture). Pour 1 c. water inside your Instant Pot. Open your Kitchen Deluxe extendable handle vegetable steamer, pull down little legs on bottom of steamer, and lower down into your pot. Put 3 artichokes in the vegetable steamer. Open leaves just slightly and sprinkle with some salt. Close lid and set to manual, pressure, for 8 minutes. Close steam valve. When done do a QR and carefully lift lid off. Sprinkle top of artichokes with a bit of salt and shredded parmesan cheese. In a bowl mix all other ingredients listed above well and serve on the side as the perfect artichoke dip! Does the calorie count for the dill dip as well? Could you just set then on the trivet if you don’t have a steamer?